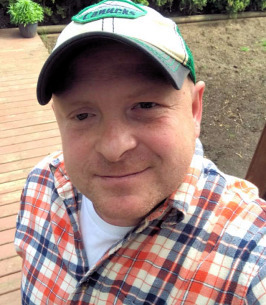 It is with profound sadness that the family of Trevor-Lee Ernest Zacharuk of Abbotsford, BC formerly of Bonnyville announces his unexpected passing on Saturday, August 18, 2018 at the age of 42 years. Trevor is lovingly survived by his two children: Cassandra & Cole Colorado of Lake Erroch, BC; three step children: Caitlyn, Jennifer & Dakota Best of Abbotsford, BC; parents: Brian & Jeannine Zacharuk of Bonnyville, AB; sister: Jodie (Dave) Millward-Zacharuk of Coquitlam, BC; partner: Leanne Best of Abbotsford, BC; mother of his children: Mandy Colorado of Lake Erroch, BC; grandfather: Ernest Bourgeois of Bonnyville, AB; as well as numerous aunts, uncles & other relatives. Trevor was predeceased by his grandparents: Nick & Alice Zacharuk, Olive Bourgeois; uncle: Paul Bourgeois; aunt: Sharon Zacharuk. Celebration of Life, Saturday, September 1, 2018 at 11:00 a.m. at Memento Funeral Chapel, Bonnyville, AB with Father Rene Realuyo officiating. Final resting place, Holy Family Roman Catholic Cemetery, Bonnyville, AB. Memorial tributes in memory of Trevor may be sent to Heart & Stroke Foundation, 10985-124 Street, NW, Edmonton, AB T5M 0H9. We encourage you to share any memorable photos or stories about Trevor-Lee. All tributes placed on and purchased through this memorial website will remain on in perpetuity for future generations. So sorry for your loss. My thoughts and prayers are with you at this very sad time. We were very sad to hear about Trevor! Our thoughts are with you all. Sorry for your loss, Brian and Jeannine, Barbara, Brad.